This product requires the base game Deus Ex: Mankind Divided. 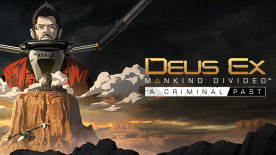 Experience Adam Jensen’s first mission for TF29, set before the events of Mankind Divided. Posing as a convicted criminal, Jensen is transferred deep into a hostile, high-security prison for augmented felons. His mission: Track down and retrieve sensitive information from a fellow undercover agent who has gone dark. Success will help the fight against terror around the world, but Jensen will need to confront a darker side to his role before the day is done. Please note that the base game is required in order to play this DLC.